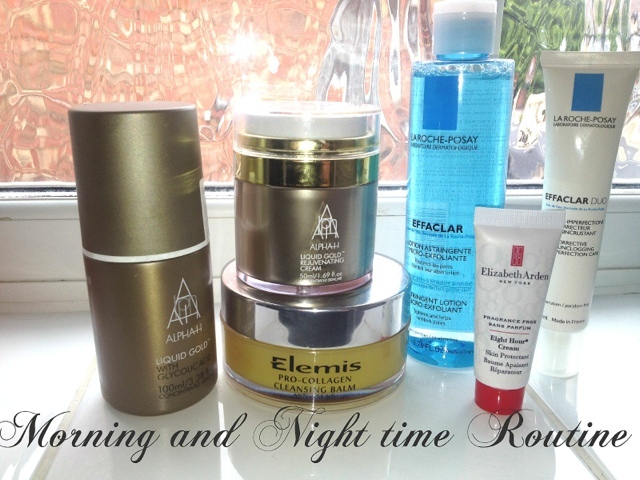 Today I thought I would share with you my skin care routine as I have never posted one before. Now, I'm ashamed to say that I haven't always looked after my skin, in fact its safe to say that I've neglected it for many years! I am really trying to look after it a lot for more, because lets face it it's/I'm not getting any younger and I think I still have time ( being 31) to rectify and prevent any damage and future ageing. I have combination skin, which steers more to the oily side at times, I get break outs, have uneven skin tone and enlarged pores that I am forever trying to minimise. I am also hitting that age when I notice "creasing" in certain areas which include my forehead and in between my eyebrows. I used to shudder at the thought of putting any moisturisers onto my skin thinking they would break me out, make me more oily and my make up would simply slide off. Here are some products that have worked for me and ones that I have been using daily for a couple of months now. Alpha H Liquid Gold - Alpha-H Liquid Gold is a powerful resurfacing and firming treatment for diminishing wrinkles, pigmentation and sun damage. This multi action formula is enriched with silk proteins, licorice extract and Glycolic Acid. It works to jump start the skin’s metabolism, tightening enlarged pores and giving a brighter, clearer complexion. Alpha H Liquid Gold Rejuvenating Cream - Alpha H Liquid Gold Rejuvenating Cream is a skin refining night moisturiser which smoothes fine lines and softens the appearance of imperfections. Enriched with Glycolic Acid, the cream gently removes dead skin build-up whilst delivering nutrients and essential antioxidant protection to help rebuild the skin cells damaged by extrinsic and intrinsic factors from environmental damage, lifestyle stress and genetic ageing. La Roche-Posay Effaclar Duo - Eliminate severe skin imperfections with the La Roche-Posay Effaclar Duo, a corrective and unclogging moisturiser. La Roche-Posay Effaclar Astringent Micro-Exfoliant Lotion -Tighten and unclog your pores with the La Roche-Posay Effaclar Astringent Micro-Exfoliant Lotion. The micro-exfoliating lotion instantly reduces pore size and fights against blockages. Elemis Pro Collagen Cleansing Balm - This powerful treatment cleansing balm dissolves make-up and daily grime. Developed first and foremost for its performance in Elemis treatments, this super-cleansing, luxurious treatment balm is expertly formulated with a 100% active base of natural oils grown within the UK. Elizabeth Arden 8 Hour Cream - Elizabeth Arden's 8 Hour Skin cream helps to soothe, restore, soften and protect chapped, dry or mildly irritated skin. 8 Hour skin cream aids in the temporary relief of chapped lips, smoothes rough spots on your knees, feet and elbows and softens tough, hard cuticles and hangnails. My morning routine is really quick and simple. I don't use too many products as I don't like my face feeling greasy and I don't have a lot of time to wait for products to sink in, I have a toddler and getting ready in the morning needs to run smoothly and quickly. 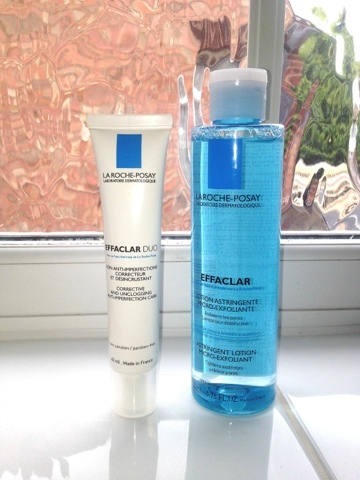 I use two products, the first is La Roche Posays Effalcar Micro Exfoliant lotion. I wipe this over my face to remove any oil and dirt, its light and refreshing, leaving my face feeling super clean. This toner removes all the oil from my skin but doesn't leave it feeling dehydrated or tight. I follow this with the La Roche Posays Effalcar Duo. This light moisturiser gives my skin enough moisture leaving it feeling hydrated without feeling greasy or oily. It almost dries matte onto the skin in no time at all and allows me to apply my make up almost straight away. I used to use this morning and night but I recently changed my routine ( which you will see below). Since using them I found my pores to be less visible and my skin tone to be more even and smoother to the touch. I give my night time routine a lot more effort than I do my mornings, I have a lot more time to spend on it and have been enjoying the results so far. Firstly I remove all my make up with the Elemis Cleansing Balm, this is a fantastic product which is very similar to the Emma Hardie cleansing balm. My make up simply melts away effortlessly and with ease. I pop a small amount of the waxy, rich and highly perfumed balm on to my face, I massage it into my skin so the balm transforms to an oil. I then add some water, massage again and then wipe it off with a damp flannel, the balm removes all my make up from the day, leaving my skin feeling silky soft and moisturised, you can read my full review here. Every 3rd night I use Alpha H Liquid Gold, this liquid exfoliant contains Glycolic acid which you leave on your skin overnight. It has the consistency of a toner which I wipe over my face with a cotton pad and then go to sleep and let it work its magic. When I first started using this it tingled very slightly on application but now my skin has got used to it and the sensation has surpassed. When I wake up in the morning my skin is left fresh, soft and with a healthy glow. On days I'm not using the Liquid Gold I use Alpha H Rejuvenating cream, this tingles slightly again but nothing unbearable, in fact I quite nice because it feels like its actually doing something. In the morning my skin looks plumped up, soft and more supple. I have found that using these 2 products together my skin has changed, my frown lines on my forehead are less prominent and I find myself not noticing them as much as I used to. My skin feels softer, smooth and just a lot more healthier that it did before using Alpha H. I will definitely keep using them and will repurchase in the future. My last product that I use at night is my Elizabeth Arden 8 Hour cream. I use this on my lips to give them a conditioning treatment, I find it quite greasy which is why I use it at night. My lips are silky soft in the morning and surprisingly the balm is still in place after a good nights sleep, which means it really is a 8 hour cream! What's your skin routine? 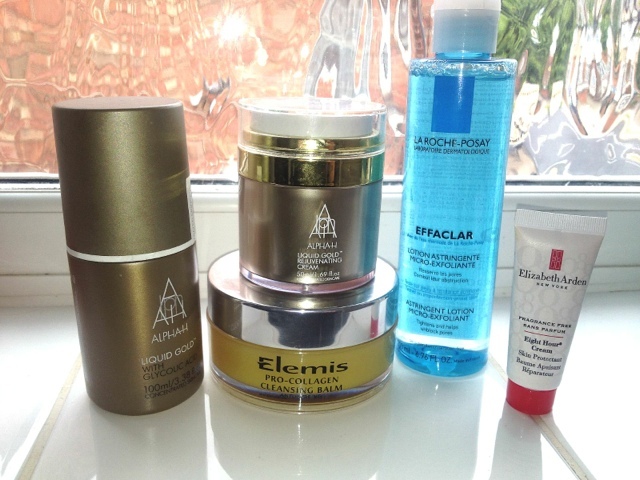 Have you used any of these products before, if so how did you get on with them? I love Elemis skincare, not tried a product yet I don't like. Great post, I love reading about other people's routines! lovely routine! I love the Alpha-H products, esp LG & the LG cream! Great beauty products.. nice blog.